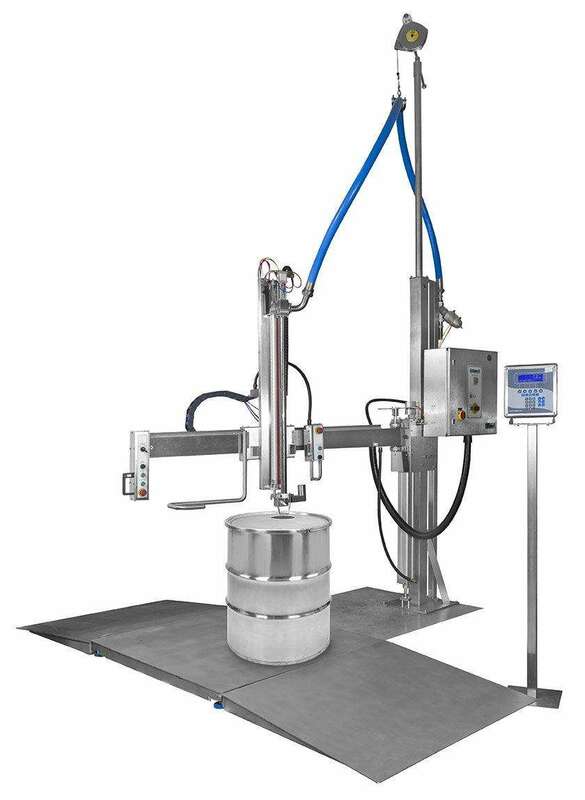 Designed for a variety of volumes including 10, 25 and 205 litre drums, these flowmeter boom fillers can also fill smaller containers providing useful back-up to other filling machines. The filling nozzle is attached to a height adjustable swinging boom arm, which allows the user a wide range of movement. The stackable container or containers are placed on a pallet, which is then moved onto the machine platform and the required volume is entered into the batch control unit. Pressing the start button activates the filling cycle and the nozzle descends into the container filling in a fast or slow pre-programmed manner, accurate to ±0.2%. With no pistons to clean, changeover time is greatly reduced and the need for cleaning effluent is minimised. The machine takes liquid directly from a pressure pump or gravity feed into the container to be filled without being measured in a volumetric cylinder. ATEX compliant versions are available.